Osama bin Laden, the glowering mastermind behind the Sept. 11, 2001, terror attacks that killed thousands of Americans, was killed in an operation led by the United States, President Barack Obama said in a dramatic late-night statement at the White House. Bin Laden living in lap of luxury in Iran? Bin Laden was holed up in a two-story house 100 yards from a Pakistani military academy when four helicopters carrying US anti-terror forces swooped in the early morning hours of Monday and killed him. Obama said he ordered the operation after receiving undisclosed intelligence information. Pakistani officials and a witness said bin Laden's guards opened fire from the roof of the building, and one of the choppers crashed. The sound of at least two explosions rocked the small northwestern town of Abbottabad where the al-Qaeda chief made his last stand Sunday. The US said no Americans were harmed in the raid. Later a US official said bin-Laden's body was buried at sea because Islamic practices call for burial within 24 hours. Finding a country willing to accept the remains of the world's most wanted terrorist would have been difficult, the official said, so the US decided to bury him at sea. "Today, at my direction, the United States launched a targeted operation against that compound in Abbottabad, Pakistan. A small team of Americans carried out the operation with extraordinary courage and capability. No Americans were harmed. They took care to avoid civilian casualties. After a firefight, they killed Osama bin Laden and took custody of his body," Obama said. But he made sure to stress that the US was not at war with Islam. "The United States is not, and never will be, at war with Islam. I’ve made clear, just as President Bush did shortly after 9/11, that our war is not against Islam. "Bin Laden was not a Muslim leader; he was a mass murderer of Muslims. Indeed, al-Qaeda has slaughtered scores of Muslims in many countries, including our own. So his demise should be welcomed by all who believe in peace and human dignity," he added. Three adult males were also killed in Sunday's raid, including one of bin Laden's sons, whom officials did not name. 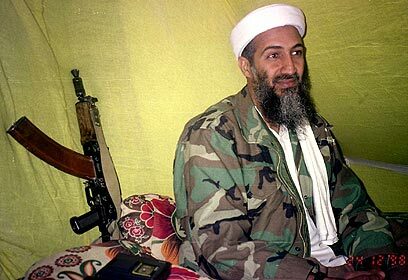 One of bin Laden's sons, Hamza, is a senior member of al-Qaeda. The news bin Laden was killed in an army town in Pakistan will raise more pointed questions of how he managed to evade capture and whether Pakistan's military and intelligence leadership knew of his whereabouts and sheltered him. Critics have long accused elements of Pakistan's security establishment of protecting bin Laden, though Islamabad has always denied this. The Palestinian Authority commended bin Laden's slaying, stating that it is "good for the peace process" and that "we must recover from the violent practices bin Laden created, together with others from around the world". Prime Minister Benjamin Netanyahu also commended the US on the terrorist's death, calling it "a resounding triumph for justice, freedom and the values shared by all democratic nations fighting shoulder to shoulder in determination against terrorism". President Shimon Peres was also pleased that a man whose targets included Israel was dead. "Bin Laden's end is one of the most important achievements in the free world. It is a great achievement for the US security forces and a proper achievement for President Obama," he said. The president said he hoped other terrorists would learn a lesson from bin Laden's death. "Such dangerous terrorists and murderers must not believe they are immune," he said. Israel is also on alert for retaliations after the top terrorist's death, especially in Gaza and northern Sinai, but a military source said Monday morning that no serious attack was expected. "We must remember that this is an organization that does not improvise attacks, but rather plans them out thoroughly," the source said. "It stands to reason that it also has a few attacks on file for such cases, but it will still be hard to carry them out with such short notice." Based on statements given by US detainees, intelligence officials have known for years that bin Laden trusted one al-Qaeda courier in particular and they believed he might be living with him in hiding. In November, intelligence officials found out where he was living, a huge fortified compound. It was surrounded by walls as high as 5.5 meters, topped with barbed wire. There were two security gates and no phone or Internet running into the house. Immediately after the declaration of bin Laden's death the State Department put US embassies on alert and warned Americans abroad of possible reprisal attacks from al-Qaeda and its affiliates around the world. In a worldwide travel alert the department said there was an "enhanced potential for anti-American violence given recent counterterrorism activity in Pakistan." It said Americans living or traveling abroad, particularly in areas that have been hit by anti-American violence in the past should limit travel outside their homes and avoid large gatherings. The alert said US embassy operations would continue "to the extent possible under the constraints of any evolving security situation." Obama's announcement comes just months before the tenth anniversary of the Sept. 11 attacks on the World Trade Center towers in New York and Pentagon in Washington, orchestrated by bin Laden's al-Qaeda organization, that killed more than 3,000 people. Al-Qaeda organization was also blamed for the 1998 bombings of two US embassies in Africa that killed 231 people and the 2000 attack on the USS Cole that killed 17 American sailors in Yemen, as well as countless other plots, some successful and some foiled. See all talkbacks "Obama: Al-Qaeda head bin Laden dead"